Temporomandibular Joint Dysfunction (TMD) refers to pain associated with the jaw joint and related muscles used to move the jaw. Because there are many painful situations that can be related to the head and neck region, this term is often confusing, but in our St. Louis holistic dental office, we can determine whether you are experiencing symptoms related to TMD. By focusing on the initial causes of your discomfort, holistic St. Louis dentist Dr. Gary Wiele designs treatment plans that are tailored to your body's biological nature and alleviates the symptoms of this condition. The temporomandibular joint is a unique joint. Unlike the rest of the joints in the body, the jaw joint is not a ball and socket. Rather, the ball portion, or condyle, of the joint is shaped like an egg laying on its side. The corresponding socket, or glenoid fossa, is also shaped unlike other sockets in the body - rather than being shaped like a cup, the glenoid fossa resembles the underneath side of a child’s slide. There is a doughnut-shaped structure between the ball and socket, which is called a disc. This cartilage disc absorbs the pressure of the joint and helps ensure smooth function. How is TMJ Dysfunction Caused? The ball slides back and up, distorting the enlarged portion of the disc. When this enlarged portion is distorted to the same thickness as the rest of the disc, the mechanical lock is lost and the disc can be displaced and then dislocated from its proper position. This slippage is often accompanied by a clicking sound. As a result, the muscles that move or support the jaw movements are forced to work harder and may become sore. Over time this may injure the muscles, causing them to form areas called trigger points which can refer pain to other areas, such as the ear, jaw, joint, teeth, etc. When left untreated, these conditions almost always get worse with time. The best hope for successfully treating TMD is to contact Dr. Wiele once the symptoms start and receive a proper diagnosis and treatment plan. The diagnosis of your TMJ disorder starts with an examination of your bite alignment as well as the temporomandibular joint. If you are experiencing a clicking jaw, Dr. Wiele may advise the use of a removable bite appliance called an orthotic. 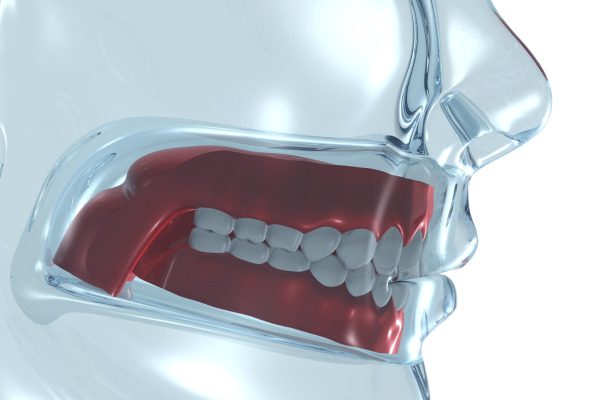 This appliance fits between the upper and lower teeth to hold the lower jaw slightly open and forward. A properly fit orthotic keeps the joint from sliding up and back, alleviating dislocation and disc distortion. Using this specialized dental appliance will help us determine whether your jaw is healthy enough to function normally. If the clicking stops in your jaw and you find yourself being able to function without pain or problems, then your jaw has retained a healthy position. Our goal moving forward is to have you maintain this jaw position without an orthotic. The orthotic appliance can usually be worn for three months without causing irreversible effects. For patients with serious jaw misalignment, jaw surgery is another viable method of treating TMD. There are two types of surgeries performed for TMD patients: temporomandibular joint surgery and orthognathic surgery. Typically, however, joint surgery only treats the symptoms and may provide patients with a temporary fix. For a permanent solution, Dr. Wiele aims to treat the cause, recommending a more comprehensive and often multi-discipline treatment solution. St. Louis, MO dentist Dr. Gary Wiele is dedicated to providing patients with holistic, comprehensive treatment solutions. If you are experiencing symptoms of TMJ dysfunction, such as sore and stiff jaw muscles, pain in your jaw, neck, shoulders, or chronic headaches, be sure to schedule an appointment with Dr. Wiele today.